This form of motorsport runs from September to June using cars that conform to a strict set of regulations governed by the Motorsports Association (MSA). Phil Haines clears hill 3 at the 2014 Summer Trials Picnic event at Tulleys Farm. Phil was competing in Class C and finished 3rd overall..
Cars have a driver and a passenger who must both remain within the seating area at all times. Engines are a maximum of 1650cc from any manufacturer. Solid rear axles or independent set-ups are allowed. Locked or limited slip differentials are banned. Control of wheel spin is by use of independent rear fiddle brakes. The objective for the competitor is to get to the top of each hill driving between the gates – marked by coloured poles, without touching them, stalling or going backwards. Cars must maintain forward motion. 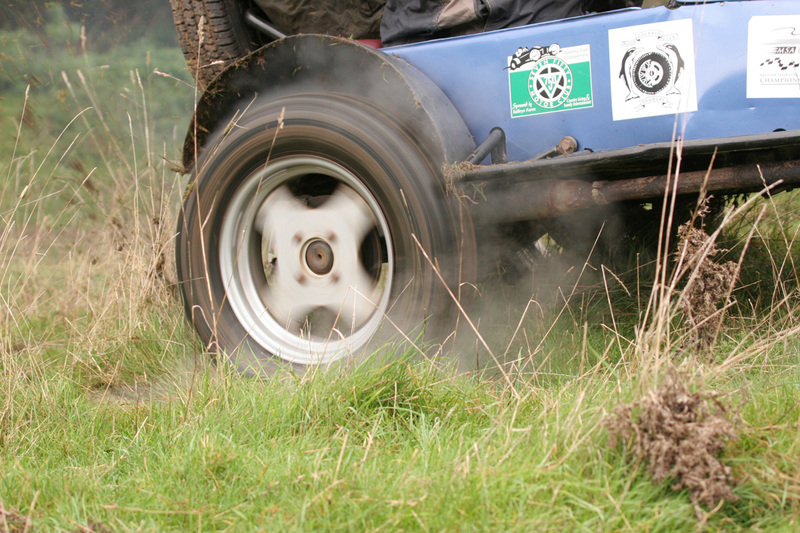 A driver only needs to get the centre of one of the front wheels past a pole to get the next gate score. 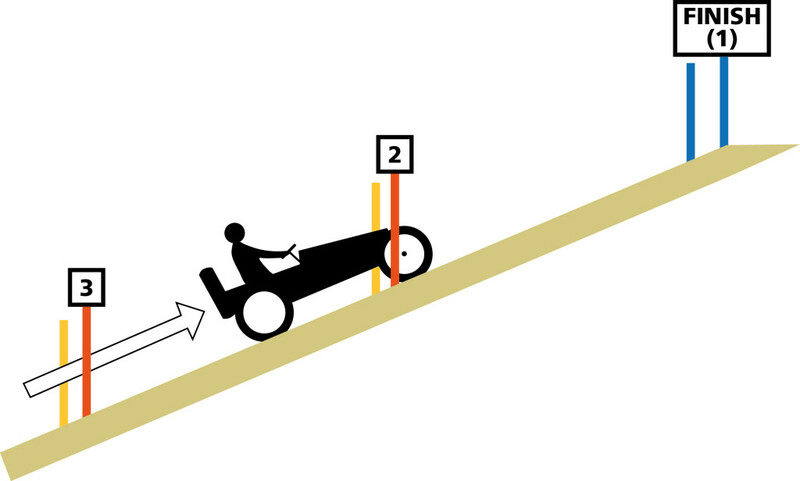 In the diagram, this driver would score 1 point if the car were to stop in this position. The gates on each hill are numbered from 12 at the bottom to 1 at the top. Passing the no 1 gate (blue poles) counts as a ‘clear’ and 0 points. The objective is to end the event with the lowest overall score. Cars range in cost from £1500 (used) to over £30,000 (new) with a typical used competitive solid rear axle car being approx £3000. Annual 750 Motor Club membership is £20. Event entry fees are typically £25 making this a very affordable sport. Club membership (for the driver) is sufficient to compete in 750 Motor Club events and many national events (where there is a ‘Clubmans’ class). You are most welcome to spectate. There is no charge. We do not have catering facilities so bring something with you. We will have a toilet tent or sometimes a portaloo. Strong footwear/wellies are advisable. We do not encourage dogs on site, however if you do bring one, please keep it on a lead at ALL TIMES. Motorsport can be dangerous for competitors and spectators. Please exercise care and keep an eye on children. Direction to trial venues can be found on the events page – just click the map buttons. Events typically start at 10am finishing at about 3.30pm. Please be aware, some parking areas are soft/slippery.